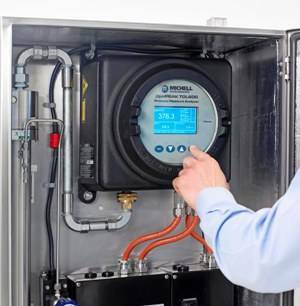 Michell Instruments has introduced a method to verify the accuracy of the OptiPEAK TDL600 moisture in natural gas analyser in the field using certified cylinders of moisture in nitrogen, rather than a methane calibration gas. Because moisture content in natural gas is a critical quality parameter, the performance of the moisture analysers is always under scrutiny. Gas transmission pipeline operators will often require periodic field verification of analyser performance to confirm the validity of on-line measurements. For the end user, being self-sufficient in carrying out these routine operations is important. However, the high precision of the OptiPEAK TDL600 presents a technical challenge. On its introduction in 2015, it offered a new class-leading benchmark for on-line Tuneable Diode Laser Absorption Spectroscopy (TDLAS) analysis of moisture content in natural gas in terms of lower detection limit to 1ppmV and accuracy of ±1ppmV or 1% of reading. Whilst this accuracy is beneficial to ensuring the quality of natural gas, it means that any verification needs a cylinder of certified moisture content. And because TDLAS analysers are configured for a defined background gas type, in this case natural gas, then the cylinder gas required is moisture in methane. Unfortunately, cylinders of methane are not always easily available in all regions and shipping a flammable high-pressure gas cylinder between countries is problematic. Realising that there was a potential problem, Michell Instruments developed a simple solution into the functionality of the TDL600 analyser. If no certified moisture in methane calibration gas is available, the user can select a second spectroscopy profile in the analyser for nitrogen background gas. The verification is then carried out using a cylinder of certified moisture in nitrogen: these are readily available around the world and are far easier and safer to ship between countries.